I have to be honest . . . there are a lot of recipe fails at my house. Most of them happen when I try to invent my own recipe . . . my poor husband dreads those “experimental meals”. But every once in a while, something wonderful comes of it and these little taquitos fall into that wonderful category! They are quick and easy to throw together- you can prepare the filling early in the day and even roll the taquitos, keep them in the fridge, and then pop them in the oven when you are ready to eat dinner. Looking for a yummy freezer meal? You can easily prep these and then freeze them. They make great lunches- just pull out the number you need and bake! Cover a large baking sheet with aluminum foil and spray lightly with cooking spray. 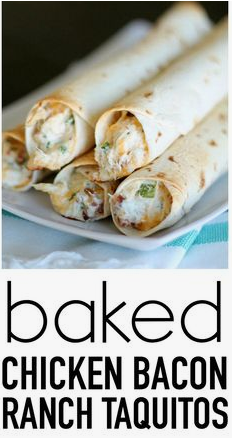 Mix together cream cheese, bacon, chicken, cheese, and green onions. Add in about 1/2 of the dry ranch dressing mix, or more if desired. Mix well. Place taquitos seam-side down on the baking sheet. Repeat about 20 times or until all the filling is used. Once finished, spray the tops of the taquitos with nonstick cooking spray and sprinkle with salt. Place pan in oven and bake for 15-20 minutes, or until edges and tops are golden. 0 Response to "Chicken Bacon Ranch Taquitos"